It is time for another cookbook giveaway! This week I am giving away a free copy of Almost Meatless by Joy Manning and Tara Mataraza Desmond. The premise of this book fits perfectly with this week’s real food mini-pled ge where we are focusing on eating locally raised meat and eating less of it. The authors have the right idea when it comes to reducing (but not giving up) meat, which will have a positive impact on both our health and the environment. With close to 70 recipes, each dish features meat such as chicken, turkey, pork, or lamb as an enhancement rather than the centerpiece of the meal. Summary: A collaboration between Manning, a former vegan, and Desmond, an unabashed meat lover, the aim is to help Americans, who they believe eat far more meat than is healthy or good for agricultural sustainability, compose meals that are both tasty and filling without having a slab of meat as the overbearing star ingredient. Instead, meat appears in smaller quantities supplemented by layers of flavor in the form of additional savory ingredients that should keep people who usually expect lots of meat from noticing the difference. To enter the contest leave a comment below sharing your most favorite “almost meatless” dish that you make at home. Only one entry is allowed per person UNLESS you “follow” 100 Days of Real Food on Twitter. If you are a Twitter follower (or become one) you are allowed two entries! The contest will end at midnight EST on Sunday, April 3. The winner will be selected at random and announced on Twitter and Facebook (as well as emailed directly so make sure your address is entered correctly in your comment below!). The winner will have 3 days to respond before they are disqualified, and a new winner is chosen. Fish Tacos from Cynthia Lair of Cookusinturptus. We have many favorite meatless meals, but my #1 favorite is probably stuffed shells…filled with tofu and ricotta. Yum! It may not be the most healthy, but I LOVE making eggplant parm. My favorite almost meatless is homemade pizza. I make 2 and on mine I don’t put any meat and use olive oil, sliced roasted tomatoes, zucchini, yellow squash, garlic and mozzarella and parmesan cheese. Sometimes some basil as well. THe boys all enjoy their red sauce meat pizza and I love mine! Pasta fagioli made from less than 2 leftover servings of meat spaghetti sauce with lots of carrots, white beans, bell peppers, mini pasta sells, diced tomatoes, tomatoe sauce, and some beef broth. Taco soup again made from less than 2 leftover servings of taco meat, black beans, brown rice, diced tomatoes, bell peppers, frozen corn, and some beef broth. Both of these are great ways to use up leftovers that alone are not enough to feed the family! My favorite meatless meal is a BLT omelet with blue cheese. I’m also a Twitter follower, so here’s my second entry. I also like quesadillas filled with pimento cheese, turkey, peppers and onions. Quiche with eggs from my own hens, with apraragus, goat cheese and pancetta! Black Bean Burgers!! yummm!!! They’re so easy to make and SO full of flavor! I also LOVE your jambalaya recipe and have made it several times! Thanks so much for these amazing opportunities, and as always thanks for your hard work informing families on healthy eating! I usually make quiche for an easy sometimes meatless meal. It’s easy to use any odd ball veggies left in the fridge. A Tex-Mex bulgur black bean creation with corn, cilantro, tomatoes, onion, etc. Yummy! corn chowder with a crumbled bacon on top! oops. Corn chowder with a little bacon on top. a skillet filled with sauteed veggies with either cooked shrimp or chicken thrown in and served over coucous or quinoa! My own concoction and changes depending on the veggies on hand at the time! We love making quesadillas and filling them with vegetables and sometimes a little chicken! We love to layer brown rice, black beans, cheddar cheese, tomatoes, lettuce, avocado, cilantro, onions, and a little beef or chicken fajita meat in a bowl. Then I make an avocado cilantro sauce that we drizzle over the top. Yum. My mouth is already watering. Ziti with sausage, tomatoes and peas. It only needs a little sausage for lots of flavor – 1/2 lb. for six servings. It is so delicious – my kids and husband LOVE it! One of my favorite almost meatless meals is homemade soup. I use mostly veggies with a little meat sometimes. Mine is a quiche with a rice crust. I use random veggies when my fridge needs a good cleaning out. we have brown rice with mushroom gravy and vegetables about one a week. Our favorite is a nice big salad with just a tad of grilled steak in it. My husband requested it tonight! I love making chicken noodle soup with tons of veggies and just a little chicken. Hmmm, we eat a lot of meatless meals…my hardest party is keeping dairy out of it 100% of the time (which I often think is just as “bad” as meat). We LOVE grilled veggie sandwiches (eggplant, zuccini, red onion, bell peppers), spread with hummus, feta cheese, and toasted whole wheat bread. YUM. Now if we do have meat, we’ll buy one really good quality, organic steak and share it between the four of us! The main focus is some yummy potatoes and a huge salad or grilled veggies. I make a lot of meatless meals, but I do like big salads with a bit of protein in them. It can be a small amount of grilled chicken, shrimp or fish along with loads of veggies. Following you on Twitter. This cookbook looks great. Would love to have a copy. Turnip Frittata – Delicious and fairly easy to make. Even my two year old enjoyed it. Mmmm meatless meals are a Fave in our house. Any bean related dish is a huge win with our 5 your old. Her favorite (ours too really) is black beans in the crock pot simmered all day with loads of garlic,cumin, and a bay leaf. Easy. Perfect. I love veggie lasagna with spinach, ricotta cheese, mushrooms and zucchini. I love to make lentil chili! Stuffed peppers! I use mostly veggies and rice with a little bit of grass feed beef. My fav is tofu fijita’s with onions, peppers, yel and zuch squash, broc, quartered roma tom and mushrooms. Add quacamole, mango salsa and choriso refried black beans to your tortilla smorgasboard, and yum yum. I make a breakfast fritata with eggs,cheese and lots of veggies(onions, green and/or red peppers, mushrooms, fried potatoes)with just a little bit of left over meat diced up and stirred into the veggies before I pour in the beaten eggs. Eggplant Parm (eggplant not fried, just cubed) with mushrooms and spinach. Zucchini and Chicken Parmesean. SO GOOD! Butternut Squash lasagna with pancetta! Yum!!!! Our favorite almost meatless is a real simple one – whole wheat pasta with tomato sauce made with a bit of ground beef, shredded carrots and zucchini. The beef adds a hint of flavor and fat, and the shredded carrots sweetens the sauce and adds nutritional value. 1. Preheat oven to 350ÂºF. 2. Bake the empty pie crust for 15 minutes or until lightly browned. Cool. 3. In a large skillet, melt the butter and combine with the olive oil over medium-high heat. Add the onions and stir until coated. Reduce heat to low; cover and cook 20 minutes or until very soft but not browned. Drain excess liquid and place in a large bowl. 4. Sprinkle the cheese into the bowl with the onions and toss gently. Put mixture into pie shell. 5. In the now empty bowl, beat the eggs; stir in remaining ingredients. Pour into pie shell. 6. Bake 50 minutes or until knife inserted in center comes out clean. Cool on rack 5 minutes before slicing. Fries Rice is our favorite almost meatless meal– and it uses up all those odd bits of vegetables, too. veggie pizza!! or any seafood dish. Almost meatless sloppy joes – a little beef or turkey & a lot of smashed beans with tomatoes & shredded carrots. Black Bean Salsa soup is a favorite in our house! I also follow on Twitter (OrganiconaDime), here’s my 2nd entry=) The recipe on the cover ofthat cookbook looks delicious! It’s very simple but so good. Whole Wheat Pasta with toasted walnuts, red onion, garlic, spinach and feta cheese. Dressing is 2tbls walnut oil and 2 tbls red wine vinegar with 1/2 tsp Dijon Mustard. Even better the next day. I actually picked up the recipe from Ellie Krieger’s cookbook. It’s my go to when I don’t know what to have for dinner. I have added grilled chicken to the Wheat Pasta… Though it doesn’t need the meat. I love my mom’s enchiladas, which really stretch ground beef! Cream cheese, black olives and sprouts on a whole-wheat bagel! I am requesting this book for two reasons, I am trying to change my eating habits and I am trying not to eat out. The Potato Corn Chowder sounds yummy! We love veggie pizza and black bean tostadas! Chicken and biscuit pot pie …for sure !! FB fan so , Turkey and pinto bean cornbread pie !! Sounds delish ! Sometimes we run out of meat in the freezer and need some new ideas. My family eats just about anything so I love to cook for them. 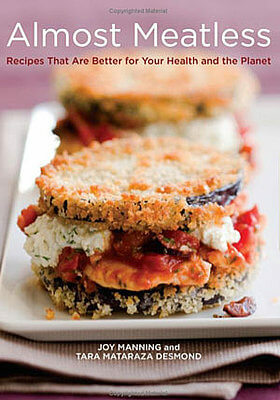 #1 I would absolutely love this cookbook! This perfectly fits what I want to be doing with my family! My favorite almost meatless recipe is spinach and bean casserole with a little pork sausage added. Cook black-eye peas in a pressure cooker for 12 minutes. Potato & asparagus casserole topped with cheddar and a couple of crumbled strips of bacon! Potato and kale soup – using very little sausage. My all-time fav, Chicken Tortilla Soup, it just hits home everytime! Yum! Beefed up bean chili is a favorite around here. Quiche! Either kale or spinach, with any other veggies on hand. Zucchini, mushrooms, red pepper, onions and of course lots of garlic, eggs and goat milk. Eggs and milk from our daughter’s farm! If on hand I’ll add bacon or ham. Always Yummy! Stir fry with tofu, over brown rice and a ton of veggies. The sauce is made with fresh ginger, garlic, and soy sauce. So colorful and delicious!